Is There a Trump-Russia Conspiracy? Now that Russia’s interference in US politics since at least 2014 is “official” with Robert Mueller’s indictments—the evidence is “incontrovertible,” H. R. McMaster, the national security special assistant says—we need to refocus on the bigger question: Why does the president of the United States persist in ignoring, excusing, and covering up Vladimir Putin’s obvious strategy—one might use “incontrovertible” a second time—to undermine our political system and our alliances? 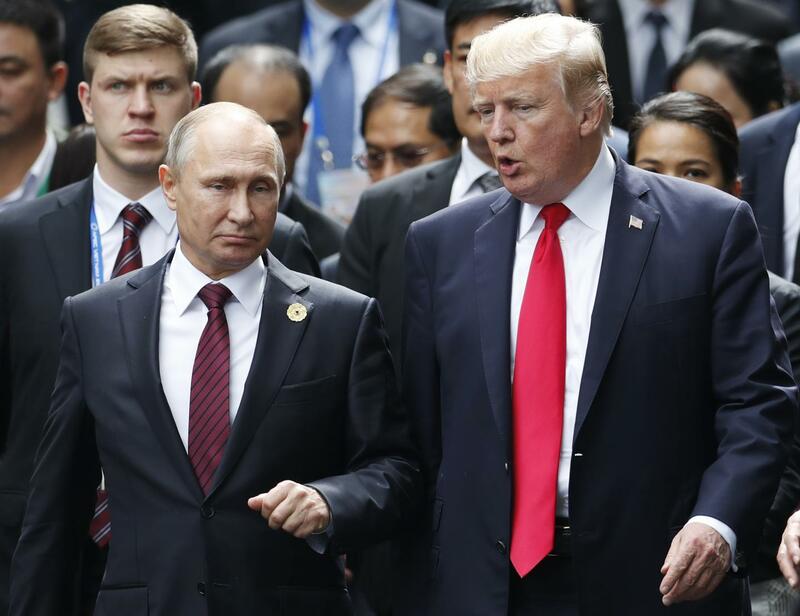 On so many fronts—Ukraine and Crimea, interference in European elections, sanctions, election meddling, Russian cyberattacks, campaign and post-campaign contact with Russian officials—Donald Trump remains in denial and has full confidence in Putin’s assurances. Far from showing a determination to respond forcefully to aggressive Russian behavior, Trump has turned the other cheek—avoiding criticism of Putin’s repression of his critics, refusing to enforce Congressional sanctions, denying or soft-peddling Russian external behavior, unwilling to limit Russian oligarchs’ capital flight to the US, failing to publish a list of Russian oligarchs who might be sanctioned. In short, when it comes to the Russians, the US commander-in-chief is AWOL; the few actions directed at Russia have all been taken at lower levels of government (Peter Baker at www.nytimes.com/2018/02/17/us/politics/trump-russia.html). I have to believe that there is something sinister at work here, something well beyond the usual explanations of Trump’s love affair with Putin. Putin must have extremely damaging information on Trump—so damaging, in fact, that if revealed, Trump’s presidency would be fatally undermined and impeachment would be a foregone conclusion. The information would have to involve collusion of the highest order—not merely Trump’s promise to go soft on Russia in exchange for Russian help with money laundering via Deutsche Bank, or debt relief, or the promise of future real estate deals in Russia. The Steele dossier suggests all kinds of indecent behavior by Trump in Moscow, but we can see from other tales of Trump’s sexual escapades that indecent behavior doesn’t damage him at all, except possibly in his marriage. So what is he hiding? I’m prepared to believe the answer amounts to a conspiracy as legally defined and punishable, with Donald Trump at its center (see Randall Eliason’s column, www.washingtonpost.com/opinions/there-seems-to-be-some-there-there/2018/02/16/001e1538-1374-11e8-8ea1-c1d91fcec3fe_story.html). Republicans in Congress simply will not go there. We have to hope Mueller’s investigation will discover, convincingly, whether or not a conspiracy against the United States has indeed taken place. Previous Post #196: Was There Really a Breakthrough in US-North Korea Relations? Sorry, I see no incontrovertible proof of major Russian government involvement in the US presidential election! This is a classic case of confirmation bias – you see what you want to see. “Weapons of mass destruction” once more.